What If Your Eye Doctor Could Monitor Your Vision From Your Home? What If You Eye Doctor Could Monitor Your Vision from Home? Were you told by your eye doctor about the importance of monitoring you vision at home to detect any vision changes? 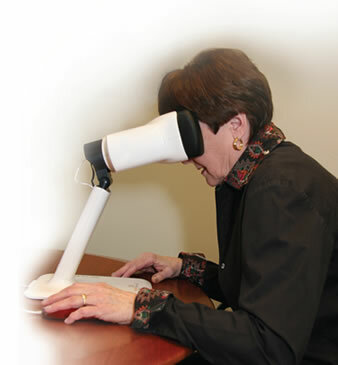 Dry macular degeneration can suddenly turn to the more severe form of AMD, wet macular degeneration. Did he also tell you how important it is to begin treatment as soon as possible to slow down or prevent any further progression of wet AMD? The February 2014 issue of Ophthalmology reported on the results of the Randomized Trial of a Home Monitoring System for Early Detection of Choroidal Neovascularization - Home Monitoring of the Eye (HOME) Study. One thousand five hundred and twenty participants 53 to 90 years of age who had dry macular degeneration and who were at risk for developing wet AMD - choroidal neovascularization (CNV) were enrolled in the Home Monitoring of the Eye Study. A device, Notal Vision's ForeseeHome, is an FDA approved device used at home that can detect even minor changes in one's vision and alert the eye doctor to these changes as well. The conclusion of this most recent study states: "Persons at high risk for developing CNV benefit from the home monitoring strategy for earlier detection of CNV development, which increases the likelihood of better visual acuity results after intravitreal anti-VEGF therapy." As of February 29, 2016 the ForeseeHome Monitoring Program is now available to eligible Medicare patients. “Notal Vision is extremely pleased to achieve this significant milestone with the ForeseeHome AMD Monitoring System. We have worked diligently for almost two years with the goal of ensuring this device is available to eligible patients enrolled in Medicare. Ultimately what this achieves is greater access to a first-of-its kind telemonitoring technology in Ophthalmology that helps AMD patients preserve their vision,” said Dr. Barak Azmon, CEO of Notal Vision.